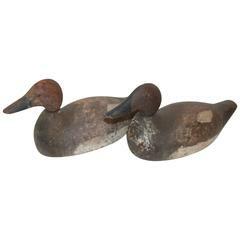 This fine pair of original painted Canadian Geese with wood heads and glass eyes are in good condition. The base is a plank of wood and body is constructed of man made material. This makes them light to float. This fine original painted Canadian goose on feet is hand carved and painted. The paint is super and has a fine aged patina. Larger decoy measures - 18 x 32 x 9 smaller decoy measures -15 x 29 x 8. This pair of wooden decoy swans were made by Martin Scorey, British contemporary artist, born 1961, great decorative items.